44 | TH E M R EP O RT SPECIAL ADVERTISING SECTION Global DMS KEY PERSONNEL Vladimir Bien-Aime President and CEO Jody Collup CMO/Operations Director Michael Quaranto CSO/VP of Technology Julie Bussey VP of Sales Mac Chiles VP of Sales CONTACT INFORMATION 1555 Bustard Road, Suite 300 Lansdale, PA 19446 Phone: 877.866.2747 Email: productinfo@globaldms.com Web: GlobalDMS.com GDMS Blog: GlobalDMS.com/blog LinkedIn: LinkedIn.com/company/ global-dms Twitter: Twitter.com/GlobalDMS Facebook: Facebook.com/ GlobalDMS/ CORPORATE PROFILE Global DMS is a leading provider of commercial and residential real estate valuation solutions catering to lenders, banks, AMCs, appraisers, and other real estate entities for all lending business channels. The company's solution set is cost-effectively delivered on a software-as-a-service (SaaS) transactional basis that ensures compliance adherence, reduces costs, increases efficiencies, prevents errors, and expedites the entire real estate appraisal and valuation process. COMPANY HISTORY Global DMS was founded in 1999 by Vladimir Bien-Aime, a web application developer with deep domain experience in the appraisal space. 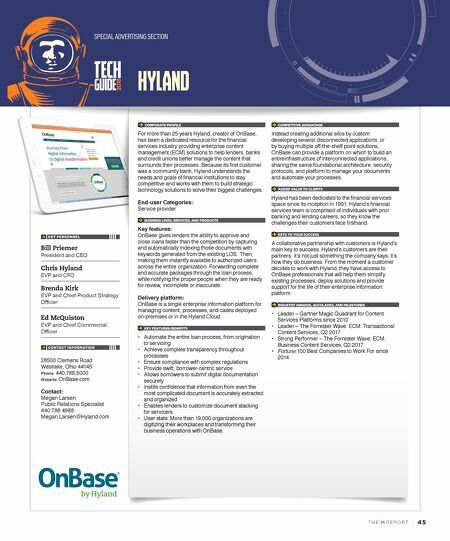 The company started with the goal of bringing efficiency and mobility to the appraisal industry leveraging web-based software and has since grown into the leading provider of web-based compliant valuation management software. Global DMS has expanded its solution set to cater to lenders, banks, AMCs, and individual appraisers. The company's centralized platform is proven to automate the entire valuation process and keep organizations in compliance. BUSINESS LINES, SERVICES, AND PRODUCTS eTrac: Global DMS's flagship product is eTrac Enterprise, a web-based single-source valuation management system that centralizes and compliantly automates all aspects of the valuation process: vendor management; order; assign; track; review; deliver; sell; and accounting functions. eTrac allows company-specific configurable workflows and real- time management reporting. Global Kinex: Compliantly and efficiently delivers appraisals to the GSEs' Uniform Collateral Data Portal (UCDP) and FHA's EAD. MARS: Proprietary automated review system identifies collateral risk, scores each appraisal report's individual risks, report findings, extracts the PDF from the MISMO XML file, and delivers the data to GSEs or other investors. eTrac WebForms: Produces appraisal and BPO reports entirely online, allowing real estate professionals to be completely mobile and autonomous. AVM/Data Products: eTrac incorporates the best- of-breed AVM models from the industry and provides access to the most robust data products available to increase valuation accuracy. Global Communicator: Facilitates client communication with their staff, vendors, and loan originators utilizing mass email. KEY FEATURES/BENEFITS eTrac provides a user interface that allows lenders and AMCs to easily communicate and transact with appraisers working in the field. The company's software offers an appraiser-facing application that provides individual appraisers with a solution to manage receiving orders, keep track of appraisals, create and deliver reports. eTrac provides automated submission to EAD and UCDP. eTrac, also allows customers to manage and drive their internal workflows and preferences. Real-time reporting is also provided. Global DMS integrates tightly with leading LOS providers, allowing clients to have access to all of eTrac's features to manage the appraisal process without ever having to leave their LOS, thus reducing errors and further streamlining the appraisal process. Global DMS offers a mobile application for appraisers operating in the field. COMPETITIVE ADVANTAGE Unlike many of its competitors, Global DMS has developed a custom platform and solution set that automates the entire valuation management process. Some vendors, however, only focus on certain parts of the appraisal process, while Global DMS handles everything via its all-in-one centralized valuation management platform. Global DMS offers numerous apps, allowing each client to pick and choose which apps they need for their business. All apps work seamlessly with eTrac including workflow, automated report builders, and Automated Review. 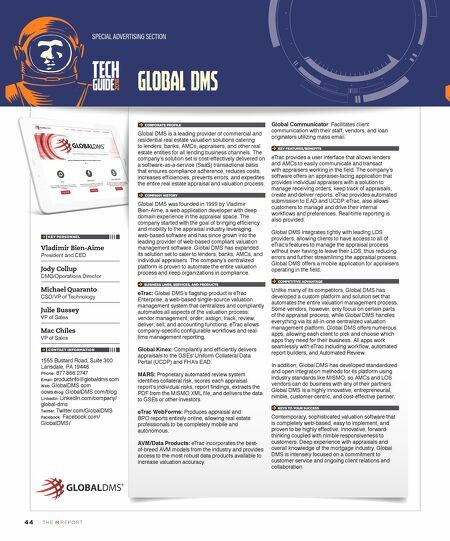 In addition, Global DMS has developed standardized and open integration methods for its platform using industry standards like MISMO, so AMCs and LOS vendors can do business with any of their partners. Global DMS is a highly innovative, entrepreneurial, nimble, customer-centric, and cost-effective partner. KEYS TO YOUR SUCCESS Contemporary, sophisticated valuation software that is completely web-based, easy to implement, and proven to be highly effective. Innovative, forward- thinking coupled with nimble responsiveness to customers. Deep experience with appraisals and overall knowledge of the mortgage industry. Global DMS is intensely focused on a commitment to customer service and ongoing client relations and collaboration.